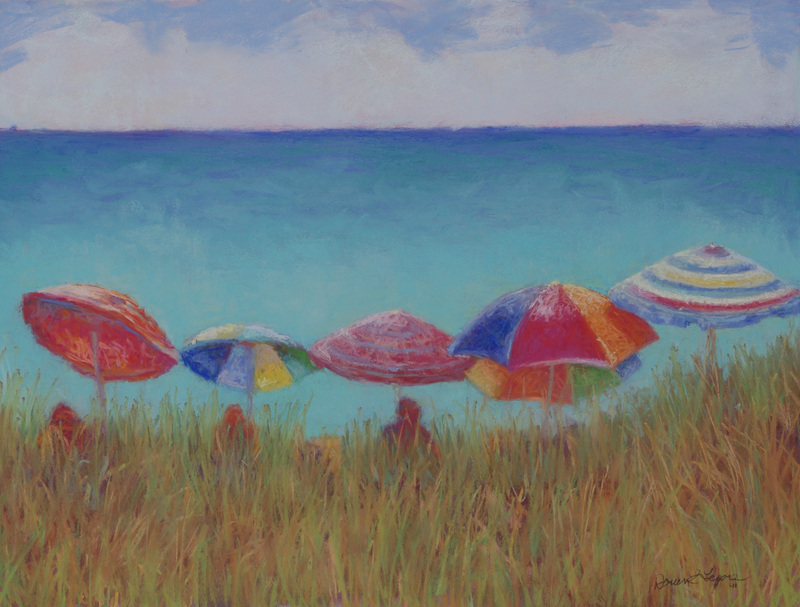 The actual title of this painting is “Postcard from Paradise” but it’s the usual spot at Hobe Sound Beach. This was done from a photograph that I had taken, actually I had taken many photographs that day because while I was there painting another painting more umbrellas kept popping up. I wanted to be sure that I had the maximum number of umbrellas and this is what I ended up with. The beach drops off and people set themselves up on the edge of the dune. This is a pastel painting on Wallis Museum Grade paper. It’s a decent size – 18×24 and I started with a water color underpainting. The underpainting is mostly a block in of complementary colors. So, in the grassy foreground I used a reddish brown and pink for the sky and water. An underpainting also saves on pastels, because the Wallis paper is a sanded paper that will eat up the pastels fairly quickly. < Hobe Sound Beach revisited!